Henry Bennett Cook was the son of Henry B and Lily Cook (nee Hardern), and was born near Ashton, Lancashire in 1921. At the beginning of the second world war Henry was with the County Courts branch of the Lord Chancellor’s Department which had been evacuated from London to be based in Thame. He was a keen footballer and on the books of Arsenal FC as an amateur. Whilst in Thame he regularly assisted the town football and cricket clubs and, when the Thame football club was compelled to cease activities due to the war, he played for Oxford City until called up for service. He was also a popular member of the Thame Institute. On the 5th June 1942, Henry received a commission as a temporary Sub-Lieutenant in the RNVR, with qualification for pilot duties in the Fleet Air Arm. On the 26th February 1943, attached to 772 Squadron FAA, at HMS Landrail, the Royal Naval Air Station Machrihanish, Scotland, Sub-Lieutenant Cook was killed whilst training for ship landing at the deck landing school. He was just 23 years old and his will was administered by his mother Lily, with effects to the value of £133. Sub Lieutenant Henry Bennett Cook, RNVR, was lost at sea on 26th February 1943 and his name is commemorated on the Lee on Solent Memorial, Gosport, Hampshire. 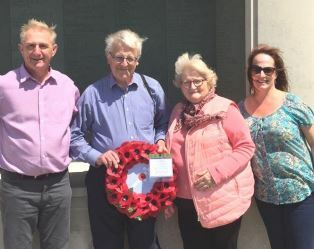 His name is to be added to Thame war memorial.